Mohs surgery is the most effective and cosmetically desirable treatment for common types of skin cancer. Dr. Zaina Rashid of La Peau Dermatology in Mesa, Arizona, has the required advanced training and clinical experience to expertly perform Mohs surgery. 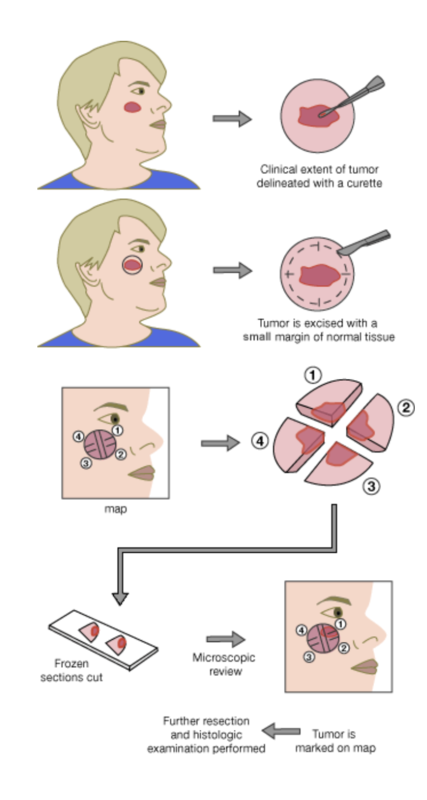 Mohs surgery is a highly-effective surgical technique used to remove the least possible amount of tissue while completely excising skin cancer lesions. This advanced micrographic procedure reduces damage to healthy surrounding tissue and also minimizes scarring. Developed in the 1930’s by Dr. Frederic Mohs, the procedure is now practiced throughout the world. It entails meticulously removing cancerous tissue one thin layer at a time, and examining it under a microscope, so that all roots and branches of the cancer are excised underneath the skin, similar to removing the the roots of a tree. What Types of Skin Cancer Can Be Treated With Mohs Surgery? Moh’s surgery has an unparalleled 98% cure rate for basal cell carcinoma and sqauamous cancers, the two most common types of skin cancers. More recently, the surgery has also been used to treat certain melanomas. Mohs surgery as an outpatient procedure performed with the use of a local anesthetic to numb the skin. During the procedure, the abnormal tissue or lesion is removed bit by bit, to include all the visible edges. The tissue is carefully mapped and color-coded and then examined under a microscope for the presence of cancer cells. Layers continue to be removed and examined until the final tissue sample studied is cancer free, also called “margins clear.” With this precise process, Dr. Rashid expunges all cancer cells while preserving as much of the healthy surrounding tissue as possible. Microscopic evaluations of excised tissue are performed on site and completed in a single visit. Can Any Dermatologist Perform Mohs Surgery? No. Mohs surgery is a highly-specialized technique, that can only be performed by dermatologists who have undergone advanced training in Mohs micrographic surgery. How Should I Prepare for My Mohs Surgery? If you have any questions, please don't hesitate to give Dr. Rashid a call - she is always here to help. To learn more about Moh's Surgery, click here to visit the American Society for Moh's Surgery.